This is written without any legal representation or binding, but of late, sources do indicate that there is a scam involving fake currency in the city area. What I was been told was that the bank note scam modus operandi is using real $10 notes, but cut into two and taped up with a fake half. As we all know, the new plastic series of $10 is tested to be so durable unlike the Malaysian RM5 which is very brittle. It is known to withstand heavy use and tested to rigorous destructive testing such as abuse inside the cash deposit machine. Usually we hear fake $50 note scams, but $10... is really taking the piss. Knowing this, anyone in possession of a fake currency can be jailed at least 3 years and caning, and as such we must not pass it on, except to call the police and hand it over. If you happen to get one of those... if you are just plain lazy... you may get away with it by destroying it. But then I am not a lawyer as I don't want to be hustled into filling out paperwork and going down the Police Station to answer silly questions. My POV is , if you feel the money is not right, don't take it. If it's torn or the serial number is tampered, don't take it, and FYI, there is a 9A Series but the color is a little bit purplish, commonly known as the Replacement Note (Previously known as the Z-Series) or the Cop Sting Money (used to catch crooks with dirty money). I just hate to be out of pocket, but the time saved is more than the hassle of dealing and getting caught in possession of a fake note. 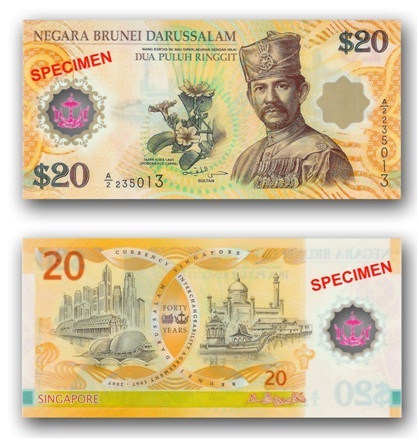 For your info, the BRUNEI Bank Note is LEGAL TENDER in Singapore but then we tend to take only up to $100, as we don't commonly see the $500, $1000 or even the $10,000 Titan notes about what more of the Brunei. The last time I saw these notes was in Temburong during NS and Reservist days and in East Malaysia. These bank notes have a common reverse side, s there is no TWENTY DOLLARS Dua Puluh Ringgit on the back. It's a commemorative $20 series. Oh ya... last I saw a $20 was 1985 which had the Concorde on it! Under Section 19(1) of the Currency Act, no person is entitled to recover from MAS the value of any mutilated note and coin. MAS is empowered to award value at its absolute discretion as an act of grace under Section 19(2). Under Section 19(3), notes and coins that have been illegally dealt with shall be repossessed by any officer of MAS when tendered for assessment. Notes and coins are considered illegally dealt with if they are impaired, diminished or affected otherwise than by fair wear and tear. Notes that have been defaced by writing or impressing with any mark, word, letter or figure or by perforation, cutting, splitting or in any other manner, are also deemed as illegally dealt with and command no value. So don't say I do not warn ye! PS: Did you know we only have $26.5 billion dollars worth of currency in circulated of which $11 Billion are the titans ($1000 & $10,000) ...surprise eh?? ?